Ekman Transport is the net motion of fluid as the result of a balance between Coriolis and turbulent drag forces. In the picture above, the wind blowing North creates a surface stress and a resulting Ekman spiral is found below it in the water column. Ekman transport, part of Ekman motion theory first investigated in 1902 by Vagn Walfrid Ekman, is the term given for the 90° net transport of the surface layer of a fluid (the layer affected by wind) by wind forcing. This phenomenon was first noted by Fridtjof Nansen, who recorded that ice transport appeared to occur at an angle to the wind direction during his Arctic expedition during the 1890s. The direction of transport is dependent on the hemisphere: in the northern hemisphere, transport occurs at 90° clockwise from wind direction, while in the southern hemisphere it occurs at a 90° counterclockwise. Ekman theory explains the theoretical state of circulation if water currents were driven only by the transfer of momentum from the wind. In the physical world, this is difficult to observe because of the influences of many simultaneous current driving forces (for example, pressure and density gradients). Though the following theory technically applies to the idealized situation involving only wind forces, Ekman motion describes the wind-driven portion of circulation seen in the surface layer. 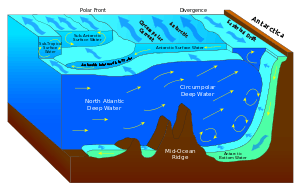 Surface currents flow at a 45° angle to the wind due to a balance between the Coriolis force and the drags generated by the wind and the water. If the ocean is divided vertically into thin layers, the magnitude of the velocity (the speed) decreases from a maximum at the surface until it dissipates. The direction also shifts slightly across each subsequent layer (right in the northern hemisphere and left in the southern hemisphere). This is called the Ekman spiral. The layer of water from the surface to the point of dissipation of this spiral is known as the Ekman layer. If all flow over the Ekman layer is integrated, the net transportation is at 90° to the right (left) of the surface wind in the northern (southern) hemisphere. the Coriolis parameter, is kept constant. where is the wind stress, is the density, is the East-West velocity, and is the north-south velocity. Here and represent the zonal and meridional mass transport terms with units of mass per unit time per unit length. Contrarily to common logic, north-south winds cause mass transport in the East-West direction. In order to understand the vertical velocity structure of the water column, equations 1 and 2 can be rewritten in terms of the vertical eddy viscosity term. where is the vertical eddy viscosity coefficient. friction is equal to wind stress at the free surface ( ). is the Ekman depth (depth of Ekman layer). By solving this at z=0, the surface current is found to be (as expected) 45 degrees to the right (left) of the wind in the Northern (Southern) Hemisphere. This also gives the expected shape of the Ekman spiral, both in magnitude and direction. Integrating these equations over the Ekman layer shows that the net Ekman transport term is 90 degrees to the right (left) of the wind in the Northern (Southern) Hemisphere. Ekman transport is a factor in coastal upwelling regimes which provide the nutrient supply for some of the largest fishing markets on the planet. Wind in these regimes blows parallel to the coast (such as along the coast of Peru, where the wind blows out of the southeast, and also in California, where it blows out of the northwest). 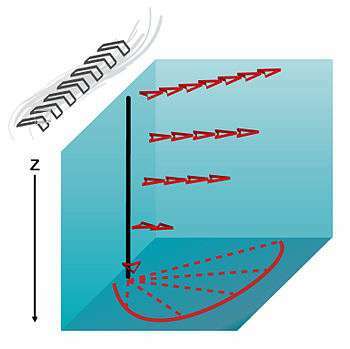 From Ekman transport, surface water has a net movement of 90° to the left in such a location. Because the surface water flows away from the coast, the water must be replaced with water from below. It is important to remember that in shallow coastal waters, the Ekman spiral is normally not fully formed and the wind events that cause upwelling episodes are typically rather short. This leads to many variations in the extent of upwelling, but the ideas are still generally applicable. Ekman transport is similarly at work in equatorial upwelling, where, in both hemispheres, a trade wind component towards the west causes a net transport of water towards the pole, and a trade wind component towards the east causes a net transport of water away from the pole. What is Ekman transport ?